During Dollarhide’s first few years as mayor, major changes took place in Compton. The city, like many urban areas in the nation at the time, underwent white flight—the exodus of middle-class white residents—and a corresponding influx of African Americans, many of whom had been displaced by the 1965 Watts riot (the Watts section of Los Angeles bordered Compton) and others who sought a suburban lifestyle. White flight contributed to Compton’s transformation from an overwhelmingly white city, which in the 1950s had been home to the family of future President George H. W. Bush, into a predominantly black city by the time of Dollarhide’s election. Whites who left Compton eventually ended up in surrounding suburbs, which often vowed to limit or exclude black residents. Dollarhide’s administration also had to contend with rising crime rates, which undermined the city’s reputation, forced property values down, and became the reason for more white flight. By the 1980s, Compton had become a city best known for rap artists N.W.A., who in their 1988 album Straight Outta Compton described the consequences of two decades of social and economic deterioration. By that point, Compton was dominated by the crime and gangs described in the rap group’s controversial and provocative lyrics. 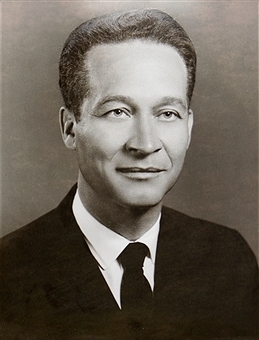 Despite the decline of Compton in the 1970s and 1980s, many California politicians remember Dollarhide as a trailblazer and pioneer for later black officeholders. The city named Compton’s Dollarhide Neighborhood Center after him. Douglas Dollarhide died at age 85 on June 28, 2008, in his home in the Northridge section of Los Angeles. Richard Elman, Ill-At-Ease in Compton (New York: Pantheon, 1967); Yussuf J. Simmonds, “African American Mayors of Compton,” Los Angeles Sentinel, June 2009, 1, https://search.proquest.com/docview/369302220?accountid=14784 (login required); and Yussuf Simmonds, “Douglas Dollarhide Dies.” Los Angeles Sentinel. n.p., July 10, 2008, https://lasentinel.net/douglas-dollarhide-dies.html.